Data analytics firm Infochimps has released a tool that’s both amusing for the casual Twitterer and useful for professionals–it’s roughly the equivalent of Google’s PageRank tech for tweets, and calculates how influential a Tweep is: Trst.me. Confused? 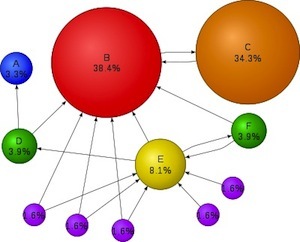 Check out this graphic explaining how PageRank itself works: The orange link C is “worth” more than the yellow one “E,” because despite having much less links connected to it, the one it does have is a much more significant one. This is how Google decides which search results bubble to the top of its search data (at least in part–the actual recipe is always evolving, and even more complex.) And Infochimps have used a similar model to work out how significant an individual Tweep in their archive actually is. The trst.me rank is a direct measure of how influential you are as a Twitterer, based on how significant your followers are. To explain this even more simply, if @StephenFry chooses to follow you your trst.me rank will rise much more than if your dad does, simply because if Fry retweets your postings, they’ll have a much more significant audience. This is a much more powerful way of measuring your Twitter influence than a mere count of your followers. On this scale I rank a fairly decent 3.8 units (chimps?) while @fastcompany levels at 6.5. Meanwhile the number one Tweep is @BarackObama with 9.9, and Twitter favorite Ashton Kutcher comes in at joint second place with 9.7. But why’s this data useful? Infochimps is confident it is, and is selling access to its archive via an API for $150 per quarter, so that people can embed the info on their web page–it’s even selling the entire dataset to researchers and marketers for a one-off fee. The usefulness is partly explained right there: Social science researchers will likely find incredibly useful data among the archives, and marketers can leverage the information they can glean about user behavior, and their company’s successes to improve how they use Twitter as a promotional tool–it may even help them target particularly influential Tweeps as contacts. And there’s one more thing: The ranking system probably behaves similarly to that which Google itself uses to choose which tweets appear as part of its new live search update feature. And since Google is never likely to release this stream as an API, trst.me’s ranking is as close as developers may get to accessing the same sort of data as Google.